However you spell it, donuts are all kinds of goodness. 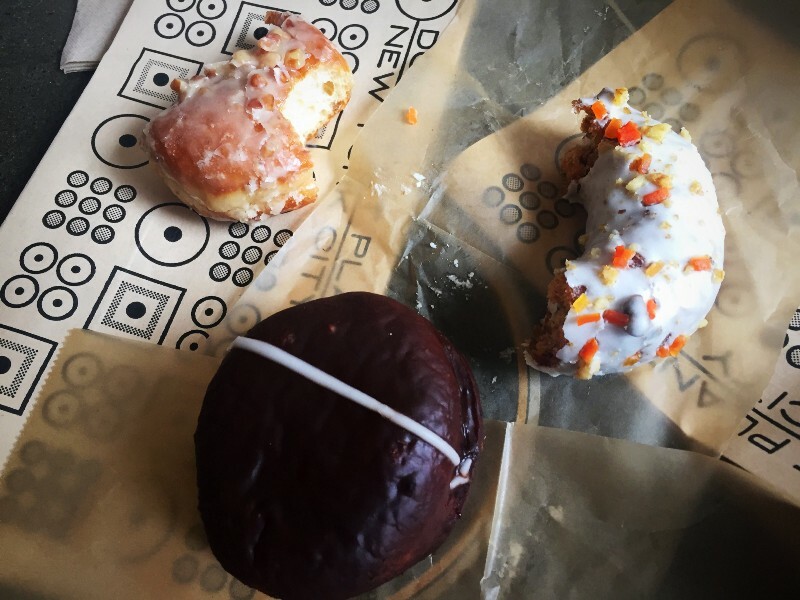 So, it was our goal — as three NYC food tech start-ups — Waddle, Dollop, and Sweetist, to find the tastiest, fluffiest, gooiest, trendiest donut places in NYC. We hit up Doughnut Plant, The Doughnut Project, Dough, The Donut Puband The Cinnamon Snail*. Ratings are on 1-not so good to 5-nom nom nom basis. Doughnut Plant opened in 1994 in a basement. It’s got a cool history going all the way back to 1910 (fun-fact: there are 9 Doughnut Plants in Japan). We visited the original Lower East Side shop, which opened in 2000. One of their inventions is the square donut. You can’t go wrong here, with Doughnut Plants all over the city, each with a huge variety of classics and creative donuts. Case in point: you can get all three types of donuts — yeast (think fluffy), cake (cake-y), and filled (mmm) — not the case in some establishments. 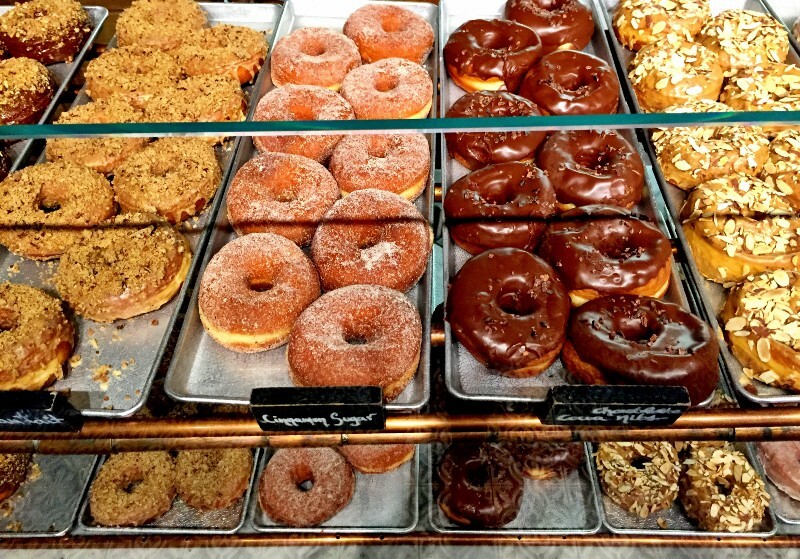 From the LES, we traveled to the West Village to sample goodies at The Doughnut Project . The Doughnut Project is a relative newbie in the world of doughnut shops in the City, opening in 2015. The Doughnut Project stands out for its cool factor. 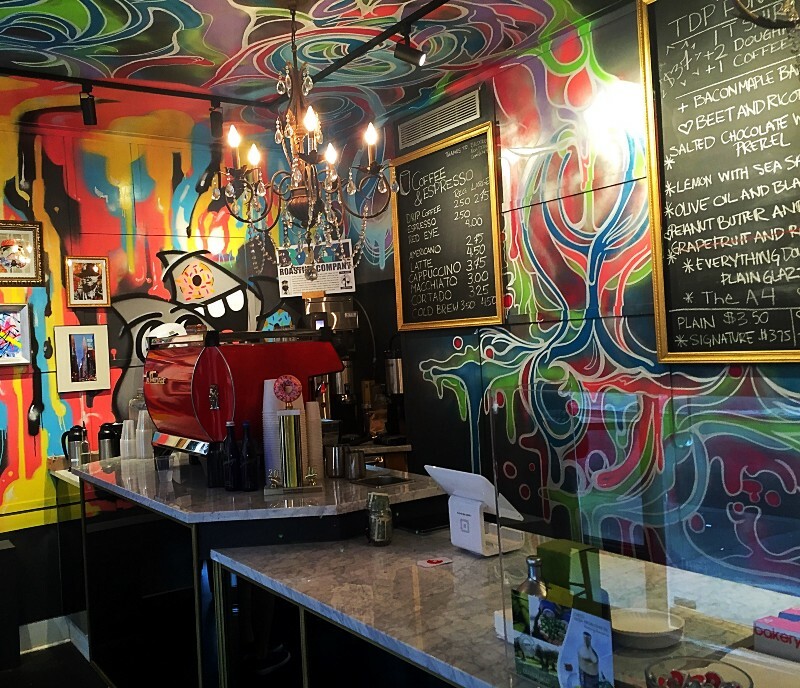 There’s graffiti on the walls and crazy eclectic donut flavors, including many savory donuts (ex. “Bulletproof Tiger,” a piquant and spicy blend of pineapple and habanero glaze). These donuts are fluffy and light. No cake donuts here, from what we could see. Ambience: Love the vibe. Trendy, colorful, friendly. 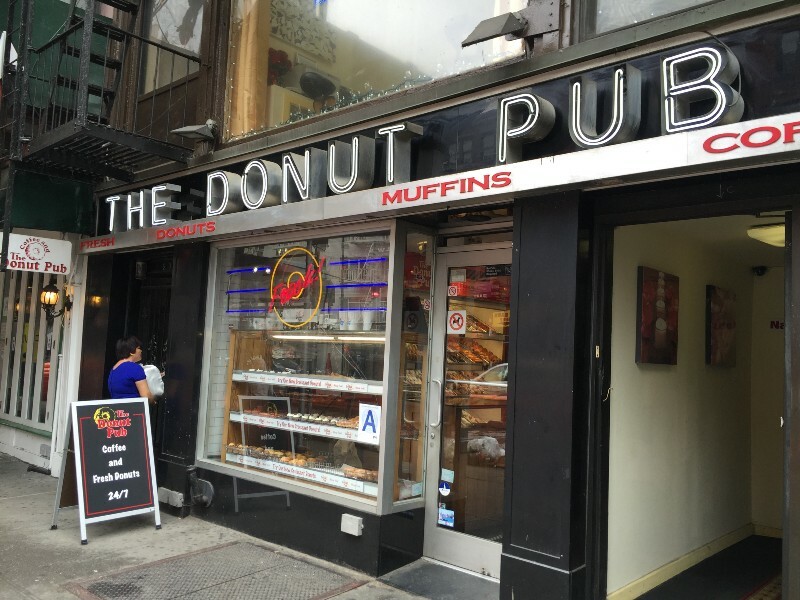 Opened in 1964 by billionaire investor Buzzy Geduld, The Donut Pub is aclassic. The Donut Pub seems like a hole in the wall on the outside, but is classic and pristine on the inside. Everything from the red leather stools to white tiled walls gives you the sense of being transported back in time. Being open 24 hours, its the perfect place for a sweet bite of drunk food — perhaps its best experienced, walking up to its glowing neon doors after a long night, grabbing a seat at the diner bar, and getting a reliable, inexpensive ($1.50) bite of perfect deep-fried dough. Ambience: “the smell reminds me of my childhood donut place”. No frills. Next stop: Union Square. Dough was founded in 2010 in by a woman Chef. So it gets bonus points for that. If you like fluffy big donuts, and only fluffy donuts, Dough is your best bet. One of the coolest things about Dough is that you can see the bakers making the donuts in front of you. The Cinnamon Snail opened in 2010 and got famous because it was an vegan and organic food truck. Since then, it shuttered its food truck operations and opened up at The Pennsy, a “high end food hall” right next to Penn Station. This shop gets definite points for creativity. So creative thatyou can’t even pronounce the name of one of its donuts (see below). Also, this is important: the founder owns a wallaby named Doyle Huckabeewho sometimes wears clothes. Ambience: Located in The Pennsy is trying hard to be modern and industrial, but it’s not a great vibe when it’s next to Penn Station. Why: I loved Doughnut Project for their ideas — the Everything Donut is something that is so unique, one part savory, two parts sweet and just the perfect idea to make it stand out. This should be on everyone’s to-try list. However, I felt that Doughnut Plant was a master of their craft. It’s clear that they have the making of a filled donut down. Every donut we tried was moist, not too sweet, with the perfect dollop of cream that complemented the doughnut itself. It was a real toss up between these two for me. I loved the Donut Pub for what it was — classic, no frills, and good value. Though the cake donuts were a little dry, their yeast donuts were fluffy and custardy. The ambiance feels a bit like an escape and probably shines best after a late night.Dough does what it does best — though their flavors weren’t as unique as some of the others, their dough is truly compelling. I think when I’m craving a donut, the huge, doughy donut at Dough is maybe what I’d go for most often. I may have to come back to the Cinnamon Snail to try it again, but the ambiance and the huge amount of choice on their menu was just not for me. Why: I ranked higher for places that surprised me and made me want to keep eating the new flavors. Don’t get me wrong, Donut Pub has a special place in my heart, and I love that I can rely on their French Crullers always, but the Doughnut Project took me by surprise and won me over. Why: That Everything donut at The Doughnut Project did it for me. Also, points for ambience and creativity. Next was the Doughnut Plant — again, pretty creative and I LOVE that it has filled donuts (these are my favorites). Dough is solid, and huge points for that nice wooden table. I like The Cinnamon Snail but not the location. The Donut Pub is eh, nothing special. It’s open 24hrs so might be tasty if it was late night and I was tipsy. The Cinnamon Snail: Can I have a vegan sandwich with that? Now go forth and eat donuts. The judges of this piece have also written on NYC southern food (yes there is good Southern food in NYC), a scrumptious coffee and gelato shop and insanely good sushi.